You don't always have to like your teammates to win in sports, but it wouldn't hurt to enjoy each other's company when you're competing for an Olympic medal. 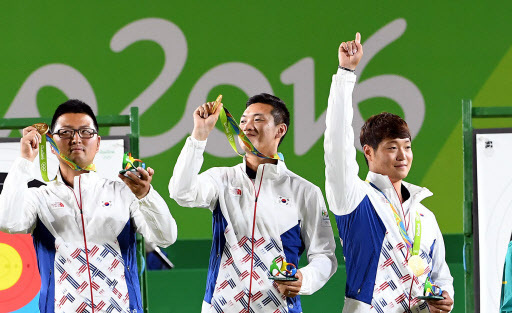 On the South Korean men's archery team, the affection that Kim Woo-jin, Ku Bon-chan and Lee Seung-yun feel for each other is genuine. And while they possess world-class skills, their teamwork played no small part in their winning the team gold medal at the Rio de Janeiro Olympics on Saturday. They're all around the same age -- Kim is 24, Ku 23 and Lee 21 -- and they say they spend as much time together away from the range as on it. Previously, South Korea had won four gold medals in the men's team event, and there were always considerable age gaps among three archers on those squads. This year's team was by far the youngest of all Olympic-winning trios, and despite whispers about their lack of experience, Kim, Ku and Lee have often said they wouldn't want it any other way. "On earlier national teams, we had some older guys, and the good thing about having teammates around my age is it's much easier to talk to each other," Kim said last month in Seoul. "We've really opened up to each other. We can talk just about everything. It's helped build trust within the team, and I think it'll be a huge asset in the team event." Then after clinching the gold Saturday, Kim said the three helped one another get through difficult moments. "We supported and encouraged each other along the way," he said. "We were talking among ourselves, 'We should trust each other and shoot with confidence.' And if we became nervous, we knew when to bide our time and take a deep breath." Ku, a class clown type who often leaves the other two in stitches, said he didn't think their relative lack of experience would impede their march to the top of the Olympic podium. "All three of us are first-time Olympians, but I don't think it will be that big of an issue," Ku said during training last month. "I am sure other countries will have archers competing in their first Olympics. Once the competition begins, everyone will be nervous all the same." On Saturday, Ku, who scored perfect 10s with all of his six arrows in the final against the United States, said his sunny facade covered up the butterflies in his stomach. "I don't think I would have done this well in the individual competition," Ku said. "I think I did so well because we all relied on each other to pull through." Park Chae-soon, the men's head coach, called his three athletes "real competitors" who would hardly be affected by swirling winds or floodlights at the Rio venue. With the team event behind them, the three archers will now go their separate ways in the individual competition starting Monday. Kim, who set a 72-arrow world record in the ranking round with 700 points Friday, is the top seed, while Ku and Lee finished sixth and 12th. They will not meet each other until the semifinals at the earliest. Park said he was worried that the archers' competitive fire may affect their friendships. "I'll make it clear that they should enjoy this tonight, and then tomorrow, they'll have to start respecting each other," the coach said. "I'll ask them to become even closer together and strengthen their camaraderie."